Color Blue with Yellow, Red, Green, and White Stripes. Short Sleeve. Size: Large. Shirt in good condition. Shows some fading due to wear and wash. No rips, stains, or holes. No size tag but fits like a medium. 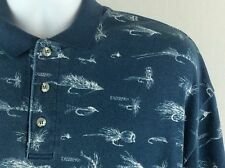 Pit to pit: 21.5" Length: 30"
Duxbak Mens 3 Button Polo Short Sleeve Blue With Fly Fishing Lures XL. Condition is Pre-owned. Shipped with USPS First Class Package (2 to 3 business days). Color: Multi Color See Photos. Size : Large. This is a Duxbak mens, button down, shirt, size large. Striped pattern and short sleeve. Clean and smoke free. Color: Striped Red, Yellow, Green & Blue. Item Condition: Very good used condition. Shirt looks like it has barely ever been worn. Example: You order 2 t-shirts. Duxbak Mens Large Beige Thick cotton Hunting Shirt button front GUC Any questions please message. 100% Cotton Jersey Knit. Knit collar and Cuffed trim. Chest 46" (23"). Shoulders 20". Pit to Pit: 23". Shoulder Seam to Shoulder Seam: 18.75". Four Pockets. Condition: Normal wear. Small mark on front, below collar. Sizing can vary widely! Sleeve Length (From Shoulder Seam To End Of Cuff): 10.5". Color: tan. Material: 100% Cotton. Length (Base Of Collar To Bottom Of Hem): 30". Size: Large. GREAT SHIRT. A-A 29", N-H 31 1/2". Excellent Vtg. stylish shirt... Totally in vogue and actually much like blue jeans never go out of style... In fact great to wear with jeans... DUXBAK ARE difficult to find.... The ones that I have found are in the range of 35 $45 plus shipping. Look at pictures I’ve included and see the style and quality of this shirt... and if you'd like any further information please contact me and I'll be more than happy to oblige!!! Excellent Vtg. stylish shirt. Totally in vogue and actually much like blue jeans never go out of style. In fact great to wear with jeans.